Steam users will be able to log into the application, currently in an invite only Closed Beta, and chat to their friends on the go, browse community groups and user profiles, view screenshots and other generated content for their favourite games, read the latest gaming news, view Steam deals and more. Hopefully this means no more missing out on Steam deals whilst away from the PC. The Steam app comes from many direct requests from our customers. Seeing which of your friends are online and playing a game, sending quick messages, looking at screenshots for an upcoming game, or catching a sale — these are all features customers have requested. Mobile is changing way people interact, play games and consume media, and the Steam app is part of our commitment to meet customer demands and expand the service functionality of Steam to make it richer and more accessible for everyone. 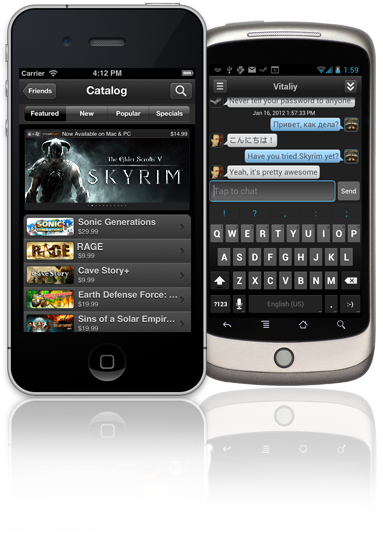 Steam mobile can be downloaded for free from the App Store or Android Market. By logging in a declaration of interest will be sent to Valve in which you may be added to the Closed Beta as the service continues to grow and develop.